1.Do Distribution Lists propagate to other PCs? 2. Do I initiate synchronization from one computer or from all? 3. Does Plug2Sync and Backup synchronize category lists? 4. I have synchronized my Outlook folders, but only some items were synchronized. How do I synchronize all items? 5. Can I synchronize any synchronized folder with my PDA or Pocket PC? 6. Do flags propagate to other users (PCs) along with items? 7. Do attachments propagate to other users (PCs) along with items? 8. Can I synchronize my Inbox or Sent Items folders using Plug2Sync and Backup? 9. Can I use Outlook Rules? 10. We have created custom forms in Outlook. Can we synchronize information using these forms? 1. Do Distribution Lists propagate to other PCs? You should initiate synchronization from one computer. 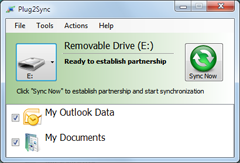 Once the initial synchronization is successful, you can start synchronizing other PCs by connecting the same external drive. No, Plug2Sync and Backup can not synchronize Outlook master category lists. By default Plug2Sync and Backup has filters for synchronization. You might want to remove them in Plug2Sync and Backup> Tools>Options>Synchronization Options tab. Select each data folder that you synchronize and Edit Filter you need. Any folder synchronized with Plug2Sync and Backup can be synchronized with PDA or Pocket PC. But usually the synchronization software (e.g. Microsoft ActiveSync) allows synchronizing only standard Outlook folders, i.e. Calendar, Contacts, Tasks, Inbox and Notes. You can’t synchronize any other folders or sub-folders. Yes, you can. But you can't synchronize Rules using Plug2Sync and Backup. Yes, the program supports synchronization of custom forms.